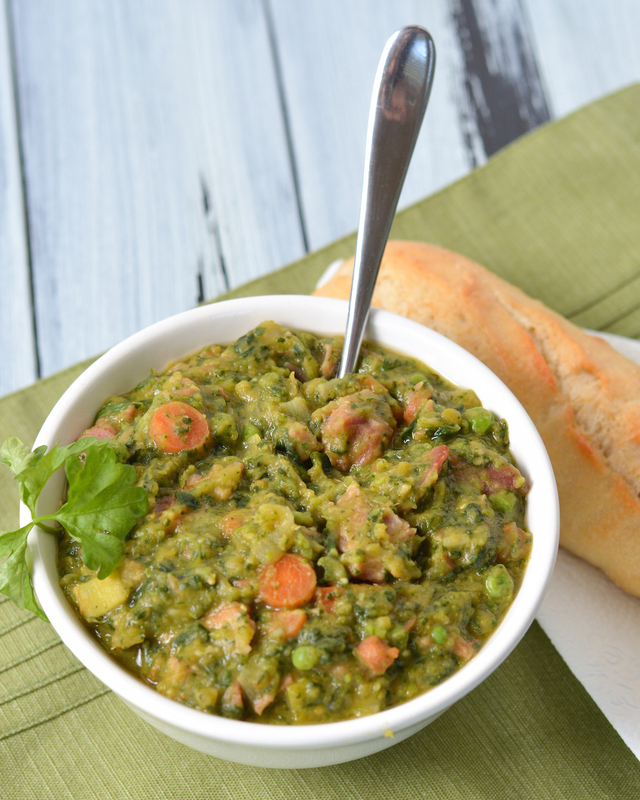 This Wintergreen Soup is a thick and hearty split pea and ham soup, amped up with extra green veggies like leeks, sweet peas and spinach! You can use a leftover holiday ham bone, or make it with a ham steak any time of year. It feels a little weird posting a hot soup, especially one with “winter” in the name, when it’s 80 degrees here today, but… I hear it’s snowing in some parts of the country. So this isn’t too out of season. I’m definitely enjoying our nice weather, but I’ll be complaining soon enough when it’s 100 degrees in May. The reason I made soup recently (besides the fact that I love soup all year round and don’t really seasonally discriminate) is that this year I ended up with the leftover ham bone from the family Easter festivities. So that was a good excuse to finally make this Wintergreen Soup, which has become one of my dad’s specialties that I definitely miss out on living across the country from him. Though a leftover holiday ham bone is perfect for this soup, you don’t have to have one. You can also use a couple ham hocks, or even a ham steak (which is what my dad uses). 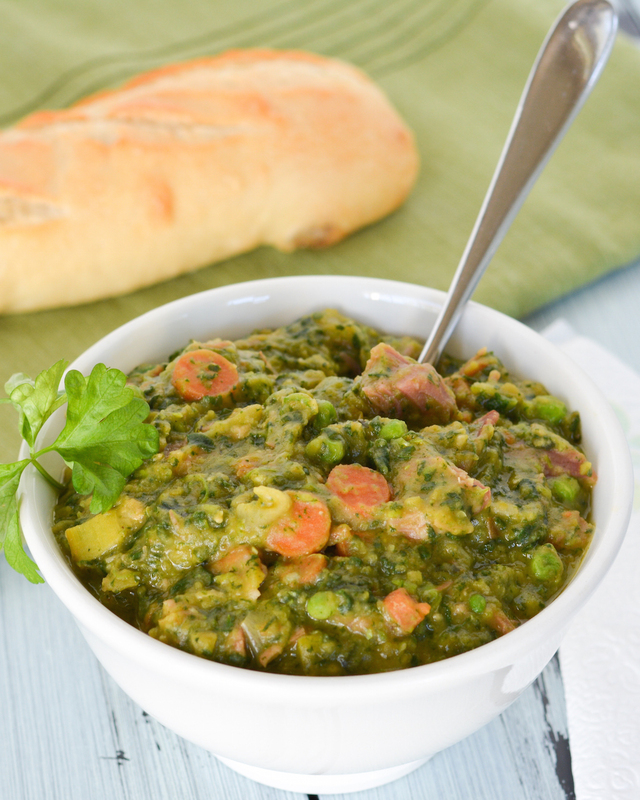 It’s basically a split pea and ham soup on crack, with lots of extra veggies thrown in! It’s nice and thick, and definitely stands on it’s own as a meal with some fresh crusty bread for dunking. Add the split peas and chicken stock to a large stock pot and bring to a boil over medium-high heat. Add the ham bone, parsley, bay leaf and thyme, reduce heat and simmer, partially covered, for 45 minutes, stirring occasionally. Meanwhile, melt the butter over medium heat in a large saute pan or Dutch oven. Add the celery, carrots, onion and leeks and saute until soft, 20-25 minutes. Transfer the cooked vegetables to the stock pot, along with the spinach and frozen peas. Stir everything together (the soup will already be a bit thick), and simmer until the split peas are tender, 25-30 minutes. Remove the ham bone and let cool slightly. Shred the meat from the bone and set aside. Process 1 cup of the soup in a blender or food processor until smooth (you can also use an immersion blender and blend directly in the pot). Stir the puree and shredded ham back into the soup, and season with salt and pepper. 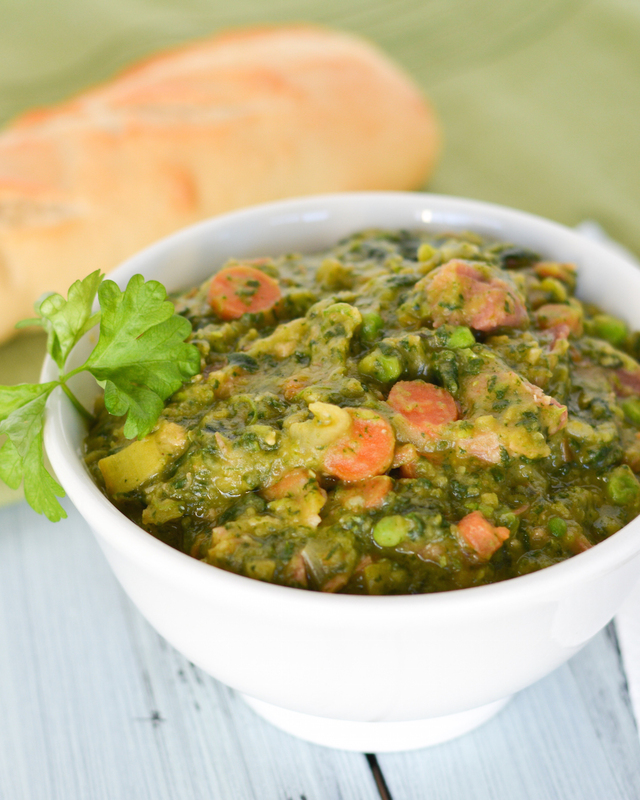 Return the soup to a simmer to warm everything through, then serve immediately with bread for dipping! Adapted from the Silver Palate Good Times Cookbook. So I’ve never tried split pea soup, but I absolutely love peas! This looks so thick and full of fresh veggies! Love it, Jess! I love soup even when it’s 100 degrees out, so I definitely don’t mind this post! Plus, it’s still cold here in Chicago, so this is fitting! My Grandma used to make split pea soup, so this reminds me of her. I love how thick this is, Jess! Sounds perfect for dinner! We got snow yesterday, so it’s definitely still soup season here! This looks so hearty and perfect for these chilly days! It’s definitely not snowing here, but that doesn’t keep me from wanting to eat a big bowl of this soup! It looks so thick and delicious! I’ll just turn the AC up and make e soup, lol! I hope you are feeling good! LOL, right?! That’s exactly what I did! 😉 I’m all for soup year-round!